Setlist (for both Czech shows) : Hard Lovin´ Man / Things I Never Said / Maybe I´m A Leo / Strange Kind Of Woman / Rapture Of The Deep / Fireball / Silver Tongue / Contact Lost / When A Blind Man Cries / Well Dressed Guitar / Almost Human / Lazy / No One Came / - Don Airey Solo / Perfect Strangers / Space Truckin´ / Smoke On The Water / -- / Hush / Black Night . "In Prague it was world premiere for Hard Lovin´ Man. The length of the show was 105 minutes. No drum solo from Paicey and no bass introduction for Black Night (Roger played the bass solo after Hush but without the singalong part). Both fantastic shows, though Olomouc was cleaner and more precise. Click the pics to see a full gallery from the Czech Republic shows. "The show in Rzeszow went down pretty well. The set list stayed the same, no drum solo from Ian Paice. They rehearsed 'Rosa's Cantina' but unfortunately didn't play the song. Anyway, it was a great chance to see the changes and a breath of fresh air. No 'Highway Star' played last night. The 'old-new' songs have brought into the set and the general reception of the music by the audience. The band are happy with the changes, going by their faces and conversations after the show. They were all having a ball on stage, particularly big Ian who was shooting another part for the Chopin movie the next day Warsaw. This is only the beginning of the tour and there were some areas the band could improve upon. They weren't as tight as previously, but I'm sure the next one is going to be much tighter. And yes, the energy levels generated were amazing. A side note on Rzeszow: the band might not have sounded that tight because the hall has particularly poor acoustics. This took toll particularly on Paicey’s drumming and Roger’s bass. Some registers of the bass guitar simply buzzed. The snare drum was way too loud and bass drum got blurred in the mix. Purple’s sound engineer, Steve and Roger were doing ttheir best to make the sound coherent, but they seem to have lost with the acoustics." "Smokin' hot!!! Man, what a show. Everything was brilliant. The sound, the musicians and the singer too. Comparing it to Rzeszow now I feel I saw two different bands, and it's not as if Rzeszow was a tragedy or anything. Everything was faultless from the beginning. During "Hard Lovin' Man" Steve nodded to Don and you could tell that the show was going to be awesome. Ian sang beautifully and interpreted his 'usual' parts in a slightly different way. Steve was fantastic, I especially loved the closing solo to 'Silver Tongue', which was played in a different way than in Rzeszow. Don shone on 'Almost Human'. Any solo he touched turned to gold. Can't say anything bad about the guy... He even changed his solo spot, keeping all the must-dos like Chopin and the Polish National Anthem. Roger was jumping around throughout the entire show, and Paicey was drumming in a steady, yet impeccable way. In 'Fireball', the moment the song starts, you can see the back curtain fall down, presenting DP logo and a building in an ancient style architecture wise. The only theatrical element in a Purple show, but it makes a nice impression - at least it did on me. Set list still the same, nothing's changed since Prague. The show was sold out. Personal favourites: Hard Lovin' Man, Silver Tongue, Almost Human, No One Came. I bought my tickets for the show straight after the gig announcement in January, tempted by the promise of it being part of a promotional tour for a new record in autumn. I had certainly dismissed the idea of taking part in another 'greatest hits reheated' show. C'mon, it's the fifth consecutive year of one big tour promoting "Rapture Of The Deep". Having four albums with Steve Morse in the can, full of great songs waiting to be developed on stage - they choose below par crapshots such as "Things I Never Said", "Silver Tongue" and "Almost Human". The rest of the set is the beaten to death golden oldies, that make you wonder how many more times they can repeat themselves again on stage. Some of them, of course, are enjoyable. "Rapture Of The Deep" stands really proud among the other items, still very impressive on stage and a true new classic. "No One Came" - that's one bet up their sleeves that can never go wrong, with frenetic soloing, strobes, pumping bass, and Ian Gillan faking the lyrics. And "Lazy", with Don Airey being immensely in the mood - you just simply can't do the harm to this indestructable boogie groove. "The last show in Poland went brilliant!ly! Although the set list stayed the same, there were notable differences. Steve changed his solos (improvised in a different way) and played a part of "Hey Joe" as an intro to "Smoke On The Water". Steve also played a slightly different solo spot. Roger played his mini solo during "Fireball" in a slightly different fashion and Paicey lost a drumstick in "Rapture Of The Deep". Ian sounded really well though the show was taking its toll on his voice and it was especially noticeable by the end. Nevertheless he performed really well and gave 100%. Another sold out show, another town, another night. 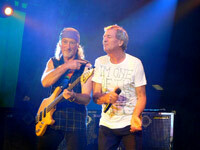 Another chapter in Deep Purple history has closed. I'm glad I had a chance to be part of it. 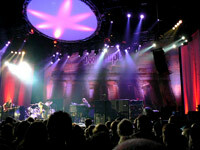 Go and see Deep Purple in concert if you get a chance. They're still the best band in the Universe and the ease with which they manoeuvre within the boundaries of the songs is amazing. Uplifting and artistic. Over and out." "Setlist : Intro ~ 1. Highway Star 2. Hard Lovin' Man 3. Maybe I'm A Leo 4. Strange Kind Of Woman 5. Rapture Of The Deep 6. Fireball 7. Silver Tongue 8. Contact Lost ~ Steve Morse Solo 9. When A Blind Man Cries 10. The Well-Dressed Guitar 11. Almost Human 12. Lazy 13. No One Came 14. Don Airey solo 15. Perfect Strangers 16. Space Truckin' 17. Band jam ~ Smoke On The Water. Encores : 18. Going Down ~ Hush 19. Bass solo ~ Black Night. The lights go down and then comes the Arabian style intro used between 2006 and 2008. The audience went wild. In the dark, the five members of Deep Purple came to the stage... And Paice began the show with the usual little introduction into Highway Star. Hard Lovin' Man isn't the set opener any more. I think that's better this way. The whole band were smiling. 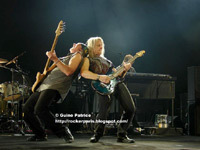 Steve Morse and Don Airey really impressed me. Ian Gillan had a lot of difficulties with the high notes, but he knew it, but had fun as always. I think they should change the key for some songs, or just drop them from the setlist eg. Fireball, Space Truckin'. It was a great surprise to hear Silver Tongue & Almost Human again. "Bananas" and "Abandon" have not been totally forgotten, that's great. I think I would have preferred I Got Your Number & Any Fule Kno That. But it was fantastic anyway. There were splendid solo spots for Morse and Airey, but sadly no drum solo from Paice. © 2010 DPAS / Darker Than Blue.